On November 5th 2013 Google honored Raymond Loewy’s 120th birthday by transforming its logo into a bullet-like version of the S1 locomotive. Few machines convey speed and power as well as the Pennsylvania Railroad’s S1 which was the largest passenger locomotive ever built. Loewy was photographed standing on the base of the S1 providing a sense of scale. It began its limited run in 1939 and was replaced in 1945 by the more versatile T1. Raymond Loewy, who designed the art deco styled shell, is considered by many to be the Father of Industrial Design. In addition to the S1 locomotive, Loewy is responsible for the Lucky Strike cigarette packet, Coca-Cola related products, interiors for Skylab, Schick's electric razors, the Greyhound bus, the IBM punchcard machines, and logos for Shell, Exxon, TWA, and the U.S. Postal Service. 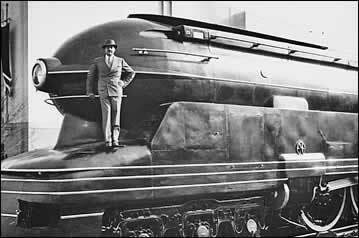 Raymond Loewy poses with the S1 locomotive in 1939. Google's logo transformed into the iconic, streamlined S1 locomotive in honor of Lowey's 120th birthday.